Bugs, tickets, requests—it’s a lot to manage, and easy to get disorganized. Instead, track everything with our IT request template. IT problems can be complex, but teams still need a simple way to report issues. All too often these requests come in from various channels, missing details, with arbitrary priority levels. That means IT teams lose track of tickets, and get pulled in too many directions. 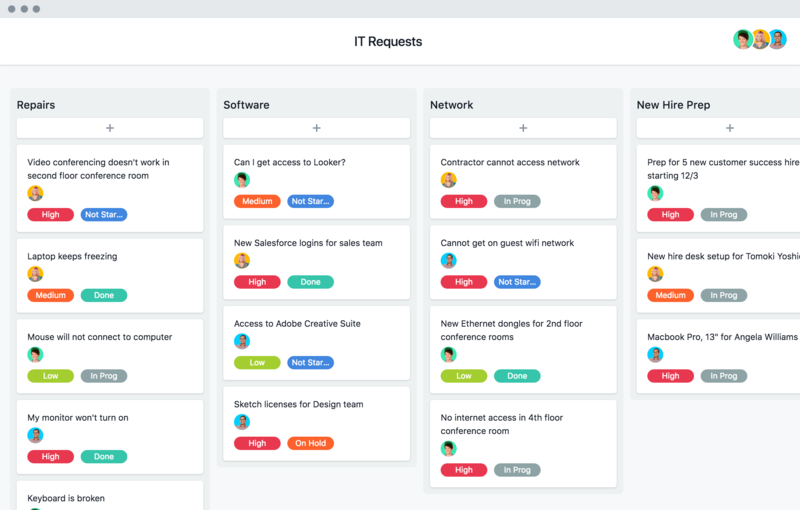 By standardizing how you track and prioritize each request with our template, you can get all the information you need without slowing your teammates—meaning issues get resolved at the right time, on time. Our tips below help you make the template your own. See all requests in one place. Have a clear picture of all the requests your team is working on to manage bandwidth and make sure nothing slips through the cracks. Keep priorities clear. Proactive prioritization ensures your team is working on the most relevant work at the right time, without getting overwhelmed. Get clarity on common requests. With project sorting, you can see if certain types of requests keep cropping up to help you improve your processes and offerings overall. Our IT requests template makes it easy to set priorities and due dates so everyone knows when to expect a solution. Paired with our tips above, you’re on your way to being more efficient and productive, instead of just putting out fires. Days derailed by quick questions? We'll show you a more productive way to file and track work. Cut the chaos that kills productivity by seeing how to track and prioritize requests in action. Get a feel for a new IT request process by watching a quick tutorial with your team. Asana Premium has the features IT teams need for ticketing, project management, and more. Start a free trial today.